Ricky Flynn is a former Damascus High School distance runner who has a knack for coming up with big performances when it counts the most. He first played the underdog role when he pulled off a cross country state title in his junior year. He ran 4:22 and 9:35 as a Damascus Hornet so he was very good, but not a nationally elite high school star. It is impossible to mention all of his honors from his days at Lynchburg College, but he is best known for climbing to the very top of the Division III ranks and winning the national cross country title in 2009. 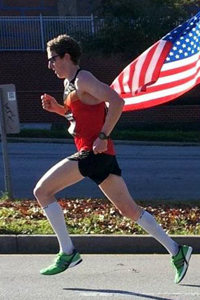 After qualifying for the US Olympic Marathon Trials with a half marathon time of 1:04.15, he exceeded all expectations to finish 12th in the Trials with a debut time of 2:13.41. In this interview, he discusses what he has been up to since college, describes the build up to the Trials, and goes into great detail on his race day experience. Mocorunning: What are you up to now? Are you still in school? Working? Flynn: I am currently working part time (about 35 hours a week) at a running store in Lynchburg, VA. I just finished grad school at Lynchburg College (same place I did my undergrad) in August 2011 where I got my MBA. So once grad school ended, I had just been working and training for the trials. Mocorunning: Clearly you stayed in tremendous shape after completing your NCAA career. When you took off the Lynchburg singlet for the final time, did you know exactly what you wanted to do athletically, or did you take some time to ponder life and figure things out? Flynn: I knew that I wanted to continue running competitively for a good while. I wasn't sure in what aspect that was going to be though. I figured I would just take it one season at a time and see where I end up. So I just kind of took a similar approach to college, where I broke my training down into 2 or 3 seasons. Fall season being more based on road races/building mileage, and the spring season more based on track races. Mocorunning: Prior to the Wilson Bridge Half Marathon, did you have any plans to train for a marathon or was that decision made based on your qualification? 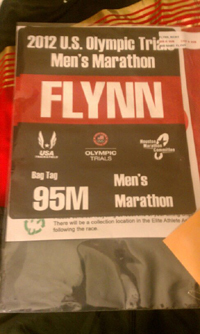 Flynn: Well I kind of had the marathon in the back of my mind. I figured I would have a good shot at hitting the half marathon qualifying time based on how my 2011 track season went, so I said why not give it a try and if it happens it happens and if it doesn't then oh well, I will just move on to the track. I always knew I would eventually train for a marathon, and always had that feeling that it would eventually be my best distance. Mocorunning: You have said that you train and coach yourself, using everything you have learned throughout the years as guidelines. What are the key principles of your training? Flynn: Yea, I do train and coach myself with the assistance of my brother, who I go to for his opinion and feedback quite often. But I just take what I have learned the past 10 years, whether it be from college coaches or from my brother or someone else, and I use that knowledge to put together a "take it as you go" approach to training. I have had a history of injuries in high school and the early years in college and I think it fits me well to train myself because I know my body the best and I know what I can and can't handle, and when to back off and when to go for it. If I had to give you one word to sum up the principles of my training it would be strength. I focus a lot on building my strength because I think thats the type of runner I am. I am not by any means a speed guy but I like to find that "red" line and see how long I can operate at that level. Mocorunning: How did you adjust your training between the half marathon and the olympic trials marathon? How high did you raise your mileage and did you change anything else besides mileage? Flynn: Yea, the adjustment from the training for the half to the full marathon was basically up the mileage and increase the length of my long runs and the intensity of those long runs. I kind of used the half marathon as a training tool in the overall cycle of the marathon training. So the half was kind of a checkpoint along the way to the marathon, assuming I hit the qualifying time. But I was doing similar workouts for each training, but my long runs increased substantially both length wise and intensity wise. Mocorunning: Have you had to deal with any injuries in the last year? Flynn: For the most part, I have been lucky enough to not have any substantial injuries. I have had those minor things along the way but nothing too serious. Although, in December I did go through a 2 week stress fracture scare with my shin, but it ended up being a stress reaction and had to take a few days off in a 2 week span and let it heal up. I owe a lot of credit to the help that my massage therapist has provided. Jim Mcfarland at Muscle Therapy in Lynchburg, VA has really helped me keep the legs healthy and fresh. Mocorunning: Describe your hardest workout in the last three months. Flynn: I don't know if I could choose just one workout for this question. I did a lot of stuff that was both mentally and physically draining. Some mornings I dreaded waking up if I had a workout scheduled. But I guess one of those was a long run I did with my brother where we covered 26+ miles and did it about at 2:30 marathon pace, after starting out in the 6 minute range. Mocorunning: Describe your Olympic Trials race day experience. Did you have butterflies on the starting line? How did the race play out for you? Flynn: Yea, it was an awesome experience overall. Being surrounded by all these fast guys for the week leading up to the race was kind of intimidating. It kind of felt like I was out of place at times. The starting line was stressful; I was confused on where to go from the warm up area and I didn't want to be late or miss something. I think I was more nervous for it being my first marathon than it being the olympic trials to be honest. I kept saying in my head "I gotta do this. I gotta do that. I can't forget to do this because who knows what is gonna happen over 26 miles." The race played out fairly well actually. I went into the race thinking 2:15 - 2:18 was my fitness level but was a bit unsure because of the time off I had to take because of the shin. I wanted to be between 5:10 and 5:15 for as long as I could and my first mile was 5:14, so that was perfect. Then once I got my 2nd mile split, I was a little worried because it was 5:02. I knew anything under 5:00 pace was deadly that early. Every mile just kind of came and went and I was running all in the sub-5:10 pace so by the time 5, 8, and 10 miles in I was committed to that faster pace and didn't want to slow up and lose the rhythm. I just kept at it and basically ran from pack to pack and just kept moving up the whole race. I got halfway and still felt decent and knew that miles 13-26 were a mystery considering I had never been there before. I took it a mile at a time. I think my 17th mile was actually 4:53 and I got real worried that would come back to me later in the race, but I think I had 4 sub-5 miles between 17 and 23 so I figured I was doing alright. Miles 24 and 25 were the most painful but I was able to hold 5:06-ish for those so I knew I was still well ahead of pace. And the last mile was tough but I knew I could hold on. I think I was able to negative split my last half so that is encouraging for hopefully any future marathons. Mocorunning: What does the future hold for you? Flynn: There are a lot of question marks in my future. That is a hard question to answer. To be honest, I am not really sure. I know I want to keep running and after this marathon, maybe see if making a career out of it is possible. Right now I am gonna take some rest and relax a bit then start training for the 5k/10k in track and see how that goes and then see where that leaves me. I do know there will be more marathons in my future, just not sure when or where yet. I also want to keep an eye out for actual career jobs...you know something that actually makes money for after I am done running.